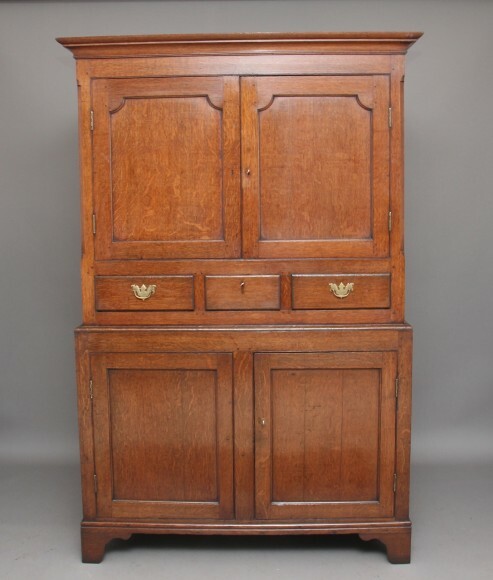 Early 19th Century Welsh oak food cupboard, having a nice moulded cornice above two shaped panelled doors opening to reveal a fixed single shelf inside, below the doors are three drawers with brass plate handles, the bottom section having two more panelled doors which also has a fixed single shelf inside, having panelled sides and standing on bracket feet, the top lifts off the base for easy transportation. A lovely honey brown colour and in great condition. Circa 1820.